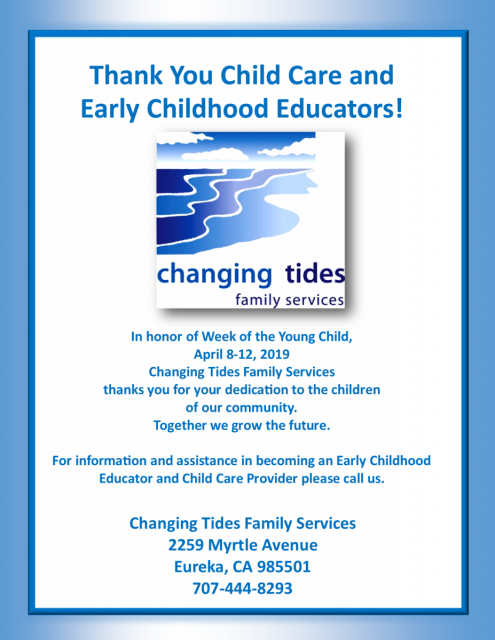 Since 1975, Changing Tides Family Services, formerly Humboldt Child Care Council, has provided diverse services to children, youth, families, individuals, and the community. Each day, Changing Tides Family Services makes it possible for thousands of families and individuals to maintain or increase their incomes, to keep family members living in their homes or community, and to enhance their physical, emotional, or developmental well-being. Changing Tides Family Services provides quality, community-based services which demonstrate the agency's values: respect, integrity, excellence, health and wellness, flexibility, and fiscal responsibility. On this website, you’ll find more information about our services for children, youth, and families—please let us know if you have any questions. Our offices are open Monday through Friday, 8:30 a.m.- 12:00 p.m. and 1:00 p.m. - 5:00 p.m.
Our main office is located at 2379 Myrtle Avenue in Eureka, corner of Glenwood Street. Check out our 2019 CalFresh Spring Newsletter! ¡Echa un vistazo a nuestro boletín de primavera de 2019 CalFresh! Check out our directory of parenting classes! Online Resource for Understanding Child Care Licensing. This resource page includes information for providers and parents and families, and uses videos as well as written information to explain topics like the how licensing works, parents’ rights in child care, what to look for in choosing a provider, and how to file a complaint. Please note that we are unable to provide anyone with this information prior to the mailing of these documents. Year-end tax documents cannot be held for pick up, they must be mailed. 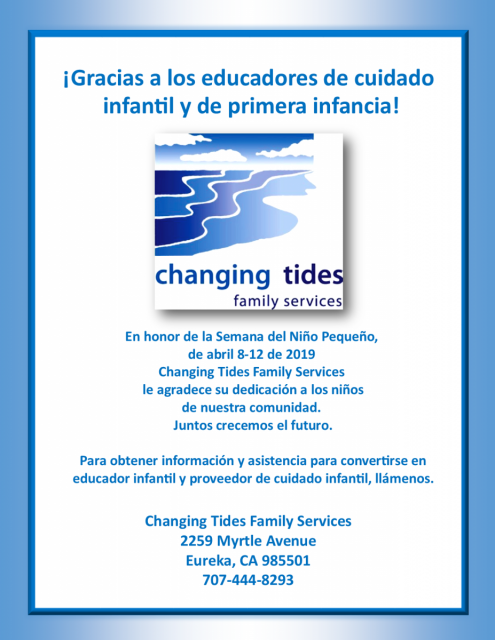 Changing Tides Family Services would like your help. Let us know how we are doing. Click here to offer feedback.